WHY MUSLIMS PREFER USING THE ARABIC WORD "ALLAH" INSTEAD OF THE ENGLISH WORD GOD? however, while speaking to the non-Muslims we may have to use the inappropriate word God, for Allah. Since the intended audience of this blog is general in nature, consisting of both Muslims as well as non-Muslims, I have used the word God instead of Allah in several places in this blog. IF "ALLAH" IS THE CORRECT NAME FOR GOD AS IS STATED IN THE QUR’AAN, THEN IS "ALLAH" MENTIONED IN OTHER RELIGIOUS SCRIPTURES BESIDES THE QUR’AAN? Almost all the major religious scriptures of the world contain the word "Allah" as one of the names of God. In the Encyclopedia Britannica, 1990 Edition, vol.1, and pg. 276 – it says, “Allah is the standard Arabic word used by Muslims as well as by Christians.” The word ALLAH appears about 7,000 times in the Hebrew Bible. In the Bible, God is very often referred to as ‘Elohim’ in the Hebrew language. The ‘im’ in the ending is a plural of honour and respect. God is referred to as ‘El’ or ‘Elah’ in the English Bible edited by Reverend C. I. Scofield. ‘Elah’ is alternatively spelled as ‘Alah’. The difference in spelling is only of a single ‘L’. Muslims spell Allah as ‘Allah’ while the Reverend has spelled it as ‘Alah’, and they pronounce it as ‘Elah’. Muslims pronounce it as Allah. Hebrew and Arabic are sister languages therefore we say it should be pronounced as ‘Allah’ and not as ‘Elah’. Exodus 3:13 & 15/Psalm 50:1 & 2- In the Hebrew it is written ALLAH. 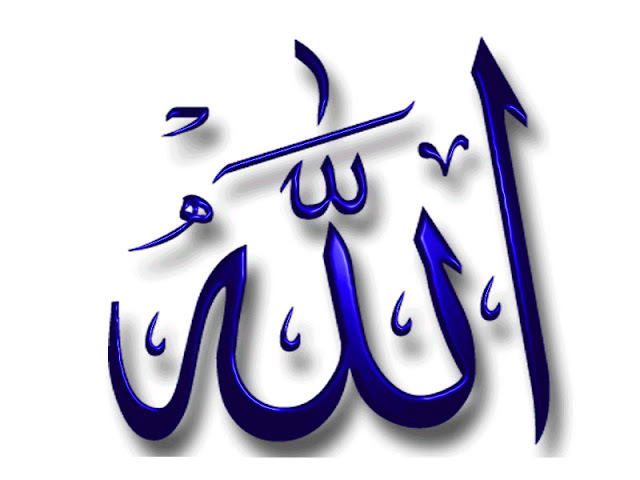 A, L, L, A, H, is Allah, as is pronounced by Muslims. b. Jesus cried out ‘Allah! Allah!’ when he was put on the cross198: It is mentioned in the New Testament in the Gospel of Mathew, chapter 27 verse 46 as well as Gospel of Mark, chap 15 verse 34 that when Jesus (pbuh) was put on the cross / stake he cried with a loud voice saying "E’Li, E’Li, la’-ma sa-bach’-tha-ni?" meaning ‘My God, My God why hast Thou Forsaken Me?’ It does not sound at all like Jehovah! Jehovah! Why have thou forsaken me? The answer is that Hebrew and Arabic are sister languages, and if you translate "E’Li, E’Li la’-ma sabach’- tha-ni" into Arabic; it is ‘Allah Allah lama tarak tani’- it sounds similar as one can see. This statement of Jesus (pbuh), "E’Li, E’Li la’-ma sa-bach’-tha-ni" is preserved in its original in each and every Bible translation which is available in more than 2,000 different languages of the world, and in each and every of them "Allah" is preserved in them. One of the names Gurunanak Sahib referred to God is "Allah". Even in the Rigveda which is the most sacred scripture of the Hindus, one of the attributes mentioned in Book no. 2 Hymn no. I verse II, is ‘Ila’ which if pronounced properly is the same as Allah. Amongst the various Upanishads, one is named as ‘Allo’ Upanishad in which God is referred to as "Allah" several times. It would be appropriate to mention here that in the Glorious Qur’aan, there are more than 100 “names” of Allah. By names we mean the qualities and powers of Allah that are manifested in those names. As an example, in just 3 verses of the Qur’aan- chapter 59:verses.22-24; -the following qualities / attributes are mentioned of Allah.